Our condo is a 2 bedroom, 2-1/2 bath unit, located at the base of Sol Vista Ski Basin. The 1200 sq. ft. unit sleeps 8 with a queen size bed in the master bedroom and king size bed in the upstairs loft bedroom. Each bedroom has its own bathroom. There is also a 1/2 bath with laundry off the living area where there are two sleeper sofas. There is a well-equipped kitchen for all your cooking needs. Numerous upgrades including wireless internet, a select movie library and curved show rod in the master bath. An in-unit hot tub allows for maximum privacy and convenience. This Mountainside unit is ski in/ski out to both the main lifts and the 'Kicking Horse' lift at Sol Vista Ski area. And at the Lodge at Silver Creek, guests may use the pool & work out equipment (included) or indulge in the Spa (optional). Sol Vista also has excellent hiking trails, and a wide variety of Mountain Biking trails accessible from the main lift, for lots of summer time enjoyment. Our condo is perfect for a family! Great location close to Rocky Mountain National Park, hiking & biking trails. More fun, horse back riding, white water rafting, 3 area golf courses (in addition to the local golf course: Headwaters!) , live theater, miniature golf, shopping, swimming and boating at Grand Lake, are all only 20 minutes from our condo. The view from the living room overlooks the Headwaters golf course with great mountain views. We are only 15 minutes from Winter Park and the Alpine slide, and more fun for the family. Enjoy the grandeur of the Rocky Mountains with Rocky Mountain National Parks west entrance only a 20 minute drive from our condo. Stop at Grand Lake for dinner!! Payments, including credit cards, accepted through Paypal. Ask about our extend stay discount. Note: As part of requested payments, we charge $100 as a refundable damage/security deposit, which we generally refund within 7 days after check and completion of unit inspection for loss/damage. View of the upper part of the Headwaters Golf course from the balcony/deck. Shared Washer & Dryer in the complex. HDTVs in living room and master bedroom. Multiple games in the unit. Sauna is available to guests free of charge at the Inn at Silver Creek. During winter pool a nicely heated indoor/outdoor pool is available to guests free of charge at the Inn at Silver Creek. During summer an additional heated outdoor is available at Mountainside. After previous years of skiing in WP, we decided to try Grandby Ranch for our 4-yr-old granddaughter's debut ski instruction; it was a great decision! Our VRBO home was the perfect space for us; the hill was just the right size for "grand girl" to learn on; the steeper terrain seems great for her skill growth; and the setting of the condo, surrounded by peaceful mountains, offered the solace of nature without the crowds of the larger venues! Loved it and looking forward to a repeat! My family and I were headed to the Granby area for an annual campout and saw the weather forecast was not looking good. We decided to book a place with better shelter than the tent. This one fit that requirement and more. Michelle was very helpful with my first booking via the HomeAway site. When we arrived, we looked around and found the place to be beyond expectations. It was very comfortable for the five of us. We have already told several of our friends, who were left to 'enjoy' their soggy tents at the camp site, how fond we were of this rental. Thanks! We stayed over President's Day weekend and enjoyed our stay. The condo lives up to its description. The condo was clean, and there were plenty of pillows, towels, and sheets. We had more than enough room for our family of 5. There is a nice big table to enjoy meals. The kitchen is very usable, and we cooked a couple of times. We really enjoyed having a private hot tub. The water had just been changed, and I think that is their normal practice to change it once a week or before every guest. The owner was also very responsive and helpful. We had a short delay getting into the condo because the previous renters had not replaced the key, but we were able to immediately reach the owner and she was able to help us get in. We found that it was quite a bit of walking to get to and from the slopes. We could certainly return to the condo for lunch, but to get to the Kicking Horse lift, you have to walk through the parking lot and cross the street (~500 ft). To get to the main lift, we walked through the upper Mountainside condos (~400 ft) with stairs. I would estimate that it took us about 10 minutes with kids and skis. Our kids enjoyed sleeping in the open loft, which has a nice big bed. However, as our kids go to bed on the early side that meant that we had to be quiet because any talking easily carried up to them. This was a little bit of an issue for us since my parents were visiting from out of town and stayed in another Mountainside unit so my family wanted to catch up after the kids went to bed. I don't think this would be an issue for everyone. 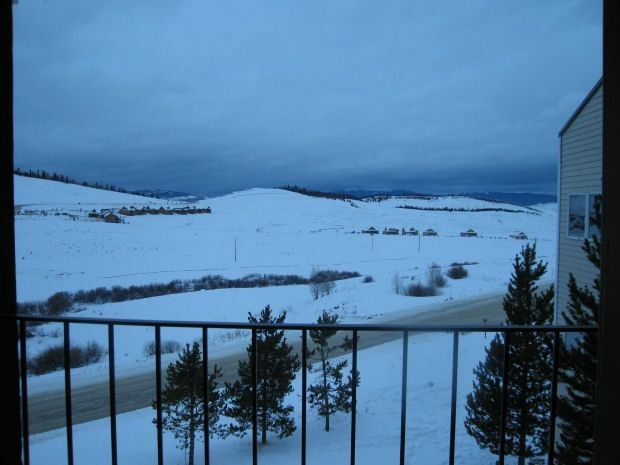 Granby Ranch is a great mountain for families and beginner skiers. We had a good experience and enjoyed a wonderful long weekend in the mountains! We really enjoyed our stay!! Michelle was available when we had questions. We had 5 kids all under the age of 9 and they had a blast. It was so fun to be able to enjoy the hot tub every evening and the kitchen was well stocked so we were able to make our meals. The kids really enjoyed sleeping in the loft. The view was beautiful as well. If we decide to come skiing in Granby again we will definitely be staying here again! Thanks! We are so happy your whole family had a nice time! We love to share our home with families who need a little get-a-way. Thank you so much for the good review. We hope to hear from you in the future. We had a group of 7 staying here for a wedding weekend. The rooms were clean, the kitchen was well stocked, and the directions were easy. It was a perfect place for us, and we didn't feel too cramped. There wasn't a lot of privacy (no rooms were completely closed off), but it worked fine for us. The view was great and the living room was comfortable. I would definitely stay here again! We also loved the indoor hot tub. Thank you so much for your kind review. We are glad you enjoyed your stay.